Mohegan Sun and its partner Suffolk Downs sought to place a casino in the Boston suburb of Revere. Mohegan Sun is positioning itself to buy the Everett casino is Wynn Resorts loses its license for Encore Boston Harbor. The Connecticut tribal casino group would have to pay Wynn Resorts roughly $2.5 billion to acquire Encore Boston Harbor, which is located in the Boston sururb of Everett. Everett Mayor Carlo DeMaria tried to shut down talk of a purchase by Mohegan Sun, claiming they were “not welcome to operate a casino in Everett.” Mayor DeMaria has a veto over any new casino operators in the city, under terms of the gaming license. It would be an ironic twist to the 5-year story of the Boston-area casino license. Mohegan Sun partnered with Suffolk Downs as the main rival to Wynn Resorts for the Boston license. The two presented two separate plans for the license, including one which included a casino development in Revere and Boston, then a second one located solely in Revere after the first plan failed in a local vote. The Mohegan Sun/Suffolk Downs development would have cost $900 million to build, while Wynn Resorts’ Everett casino was estimated to cost $1.6 billion. Eventually, the cost of the Wynn Boston Harbor (later renamed “Encore“) swelled to $2.4 billion and eventually to its current price of $2.5 billion. The real irony is Mohegan Sun sued the Massachusetts Gaming Commission for offering Wynn Resorts preferential treatment. 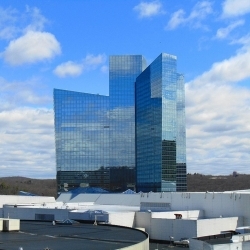 The licensing decision was a bitter one, with Mohegan Sun feuding with the MGC and Wynn Resorts. Mohegan Sun to Buy Encore Boston Harbor? All that underscores the Connecticut Native American tribe’s interest in a Boston casino. In its hay day, Mohegan Sun was one of two casinos in all of New England and it drew huge traffic from Boston and New York City. That made Mohegan Sun one of the biggest and most lucrative casinos in the world. Much has changed since then. Massachusetts, Rhode Island, New York, and Pennsylvania legalized land-based casino gambling in one form or another. Where it originally drew customers from all over the eastern seaboard, Mohegan Sun now is fighting to maintain gamblers from Connecticut in an increasingly fragmented, saturated New England gambling market. Acquiring the Everett casino would be a boon for Mohegan Sun. The company still has its huge database of Boston-area and Massachusetts players. It would make the most sense of all casino operators to buy the Everett casino license, if it becomes available. Availability is another matter. Wynn Resorts still holds the license and is expected to maintain it, pending the Massachusetts Gaming Commission’s report on Wynn’s suitability for owning the Everett casino. Since May 2018, the Gaming Commission has been investigating whether Wynn Resorts’ board of directors is worthy to own the Boston license. The probe stems from founder and former CEO Steve Wynn’s role in Wynn Resorts down through the years. Steve Wynn left the company and divested himself of Wynn stock earlier this year after a series of sexual harassment allegations rocked the company. Elaine Wynn, Steve Wynn’s estranged ex-wife and the remaining top shareholder in the company, argued that the board needed to be purged of Steve Wynn acolytes, because they covered up for their former boss. That led to an investigation of 13 current and former executives in Wynn, with a report due out in December. Will Wynn Resorts Retain Encore Boston Harbor? Many predict Wynn Resorts will keep the license. If not, then a variety of US gaming companies will seek to buy Encore Boston Harbor. The announcement that Mohegan Sun would buy Encore Boston Harbor might be an attempt to undercut Wynn CEO Matt Maddox and Everett Mayor Carlo DeMaria’s narrative that the Massachusetts Gaming Commission’s withdrawing the Wynn license would be the end of the Everett Casino. DeMaria recently described the MGC’s decision as a matter of “life or death” for his city and the casino itself, though if Wynn lost the license, it would simply sell the casino to another gaming company. MGM Resorts has been linked to the sale, though it is illegal to own two casino licenses in Massachusetts. MGM Resorts would have to sell MGM Springfield. Mohegan Sun and Foxwoods are the next likeliest candidates if that happened, because of their ties to New England gamblers, but Mohegan Sun and the city of Everett have bad blood. Carlo DeMaria could veto Mohegan Sun’s purchase, so a lot of ifs remain in the deal.